Ventricular septal defect (VSD) accounts for approximately 20% of all forms of congenital heart disease. The conventional treatment has been the surgical closure of these defects. Percutaneous closure of VSD had been attempted in the past but it was not until the development of Amplatzer Muscular VSD occluder device that the higher closure rates and safety of the procedure made it an attractive alternative to the surgical closure. Amplatzer VSD devices have also been designed to close perimembranous and post infarction muscular VSDs and the results have been encouraging. 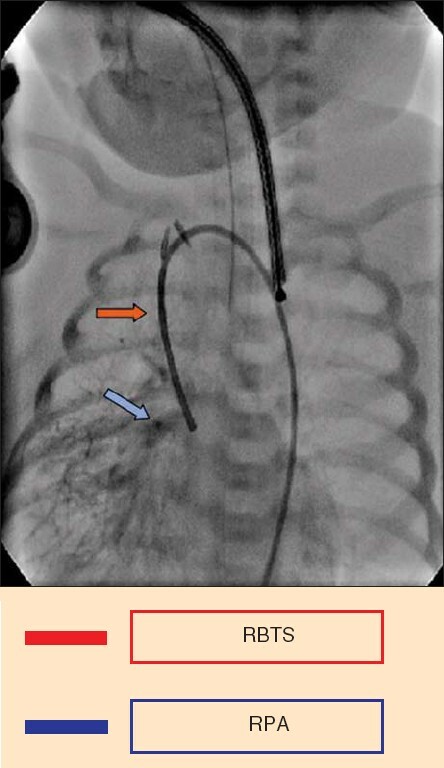 In addition to the percutaneous conventional approach, an intraoperative (perventricular) technique has been developed to allow safe VSD closure with Amplatzer devices in small infants with poor vascular access avoiding the need of cardiopulmonary bypass or in infants with concomitant cardiac defects requiring surgical repair. In this review the transcatheter VSD closure with Amplatzer VSD occluders will be discussed for each type of VSD and the technical aspects will be detailed. Background: Walking for exercise is a purposeful or structured activity that can be captured relatively easily in surveys focused on leisure time activity. In contrast, walking for transport is an incidental activity that is likely to be missed using these same assessment approaches. Therefore, the purpose of this analysis was to utilize 1997 Australian Bureau of Statistics (ABS) Time Use Survey diary data to describe nationally representative patterns of walking for transport and for exercise. Methods: Household members ≥ 15 years of age were recruited from over 4,550 randomly selected private dwellings in Australia. Time use diaries were collected for two designated days during all four seasons over the calendar year. 3,471 males and 3,776 females (94% household response rate and 84% person response rate) provided 14,315 diary days of data. The raw diary data were coded and summarized into bouts and minutes that included walking for transport and for exercise. 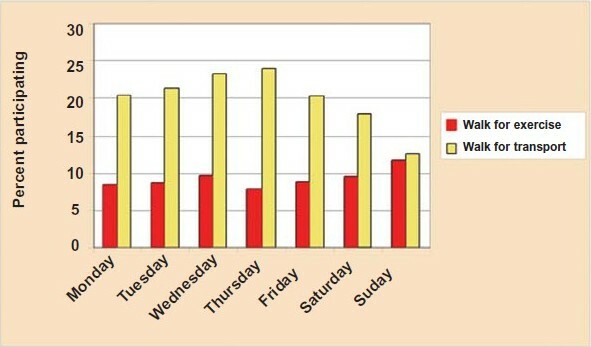 Results: Walking for transport was indicated on a higher proportion of days compared to walking for exercise (20 vs 9%). Based on participant sub-samples ('doers'; those actually performing the activity) walking for transport was performed over 2.3 ± 1.4 bouts/day (12.5 minutes/bout) for a total of ≈28 mins/day and walking for exercise over 1.2 ± 0.5 bouts/day (47 minutes/bout) for a total of ≈56 mins/day. Conclusion: Although walking for transport is typically undertaken in multiple brief bouts, accumulated durations approximate public health guidelines for those who report any walking for transport. Background: Evidence based drug therapy (EBT) is defined in a way that emphasizes the importance of outcomes and states, that a doctor makes his decisions according to the best available knowledge. EBT narrowly defines "evidence" for effective, ethical therapy as 'results' from double-blind research done with randomly controlled clinical trials (RCTs). Cardiovascular disease (CVD) and drug therapy is a rapidly changing field and one is always open to new evidence or evidence that may have been overlooked in the past. Not all doctors want or need to learn how to practice all five steps of EBT, indeed, most doctors consider themselves users of EBT. Clinical practice requires more stable data in the literature and especially in the teaching and training textbooks. Practicing EBT is an advance in drug therapy and is believed to help relieve contradiction and confusion of the therapy. Objectives : Our aim was to explore the new clinical evidence in the treatment of CVD in clinical practice and the availability of RCTs in the textbooks and commonly used literature. Methods : Cross-sectional interview survey of 20 physicians in the cardiac centre, Althawra teaching hospital, Sanaa, Yemen; to understand the drug use in regard to the EBT (clinically evidenced RCTs) or the mechanism of actions and experiences (non-clinical evidences) especially focusing on ischemic heart disease and heart failure. The five commonly used textbooks were studied for the availability of RCTs. Results : In chronic ischemic heart diseases, ABC regimen (Aspirin, B-blockers, and angiotensin converting enzyme inhibitors, Captopril) as secondary prevention was selected by most of the physicians (70%), while nitrates put as first drug of choice for chronic ischemia more by general physicians (30%). In the treatment of congestive heart failure (CHF), digoxin (10%) was reported to be the first choice more by the newly graduated physicians. All new editions of the textbooks have included the RCTs as the basis for the therapy in clinical practice, especially in Braunwald Heart disease and Davidsons Medicine. Conclusions : Results showed a need for a correlation between basic evidence and clinical evidence (EBT). Including the RCTs in the commonly used textbooks may help in the familiarity for searching new evidence and will help to relieve some of the confusion about clinical practice of therapy. Background : Elevated low-density lipoprotein cholesterol (LDL-C) is a major cause of coronary heart disease (CHD). The relationship between LDL-C and CHD risk is continuous over a broad range of LDL-C levels: the higher the LDL-C level, the greater the risk of CHD1. Although national guidelines for cholesterol management have existed since 19882, many patients with elevated cholesterol do not achieve their target cholesterol with treatment. Our aim was to identify the rate of lipid control in the cardiology outpatient clinics of Hamad General Hospita, and this may lead to improved patient care. This is the first out-patient data study performed in our department. Methods : Cohort study of one -hundred and one (101) consecutive documented CHD patients investigated for lipid profile. Blood samples were taken after a strict 12 hours of fasting, the presence of diabetes was also recorded. Results: LDL-C level was less than 2.6 mmol/l in 55 patients (54%), with a mean of 2.66 mmol/l; while HDL-C level was more than 1.15 mmol/l in 76 patients (75%), with a mean level of 1.08 mmol/l. Triglyceride level was less than 1.7 mmol/l in 51 patients (50%), with mean level of 2.22 mmol/l. 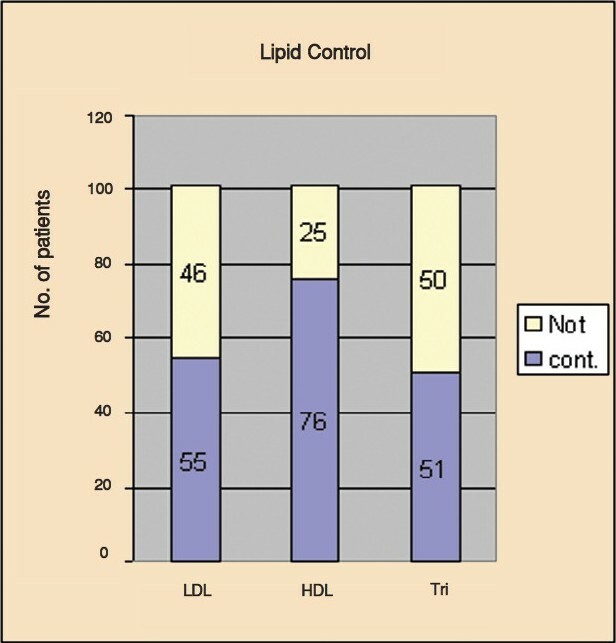 Conclusions : Acceptable lipid control was achieved in the cardiology outpatient clinics in Hamad General Hospital and the majority of CHD patients were on lipid lowering therapy.